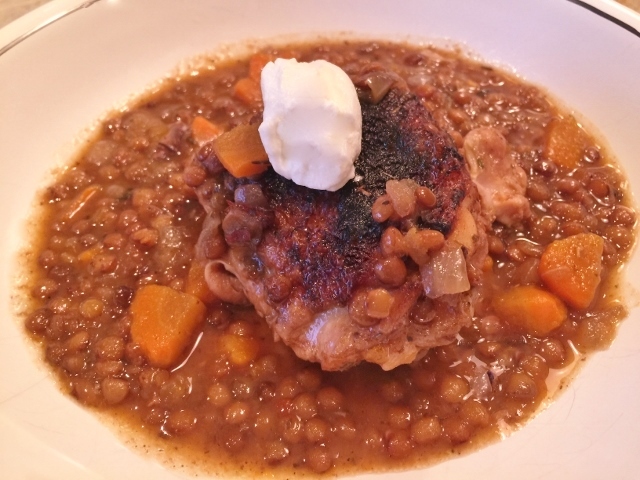 Slow-Cooker Chicken & Lentils - Recipe! - Live. Love. Laugh. Food. Slow-Cooker Chicken & Lentils – Recipe! The Instant Pot has taken precedent over my slow-cooker the last year or so, but my slow-cooker is still very much alive in my cooking repertoire, especially during the week. Whether you work all day from home or a bustling office, slow cooking is a nice option if you want to look forward to a hot meal the second you are ready to eat. I remember when I had to wear a suit all day – I couldn’t get it off fast enough and head into my kitchen for an enticing slow-cooked meal. 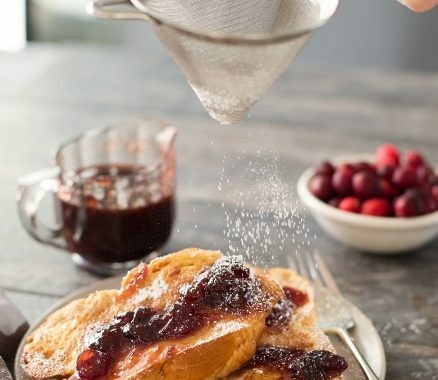 Even today as I work from home, I still feel the same way about a slow-cooked dinner – it’s so pleasant to have warming scents wafting about as I write and prepare my recipes. 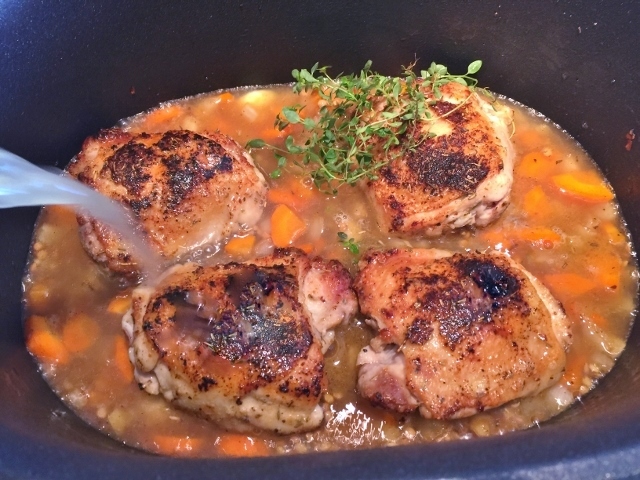 Braising meat is definitely the way to go when it comes to slow cooking and chicken thighs are not only economical, but tenderize beautifully in a slow-cooker. 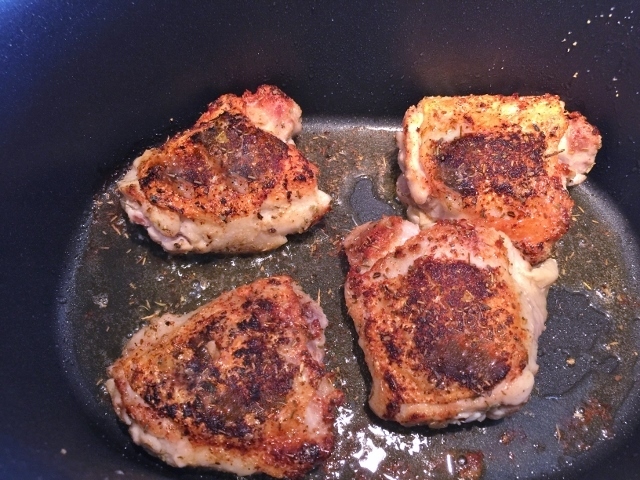 Coating the chicken thighs first in a dry-rub makes all the difference in the world when it comes to boosting flavor because the thighs act like little sponges and take-in all that extra spice magic. This recipe is simple to prepare with just a few ingredients, especially if you already have dry herbs on hand. 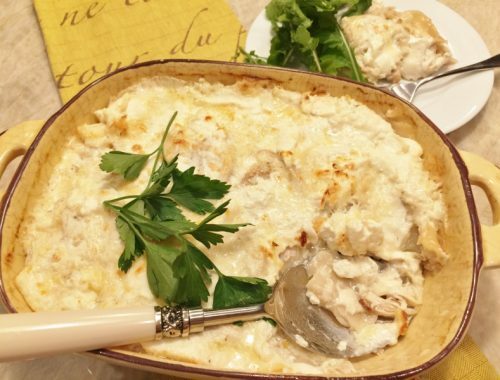 This meal reminds me of French-Country cooking with the combination of thyme and chicken. I thoroughly enjoy the earthy flavors of lentils along with the succulent dark meat chicken – I think the combination is perfection. If dark meat is not your thing, you can substitute chicken breasts, just cut the cooking time down by an hour, so you don’t overcook the white meat. 1. In a small bowl, combine onion powder, garlic powder, paprika, herbs de provence and 1 teaspoon of salt. Stir to combine. Pat chicken dry with paper towels and sprinkle dry rub on both sides of chicken. 2. Place insert of slow cooker or a large pot on stove over medium-high heat. Add 2 tablespoons of oil to pot and heat for 2 minutes. Add chicken, skin side down to pot and brown for 4 minutes. Turn chicken over and cook on other side for 3 minutes. 3. Remove chicken from pot and set it on a plate. Add onions and carrot to pot with chicken juices and saute for 3 minutes. Skin your garlic, but keep it whole and add it to onion mixture. Add 1 1/2 teaspoons of salt and a pinch of pepper flakes to onion mixture and stir to combine. 4. 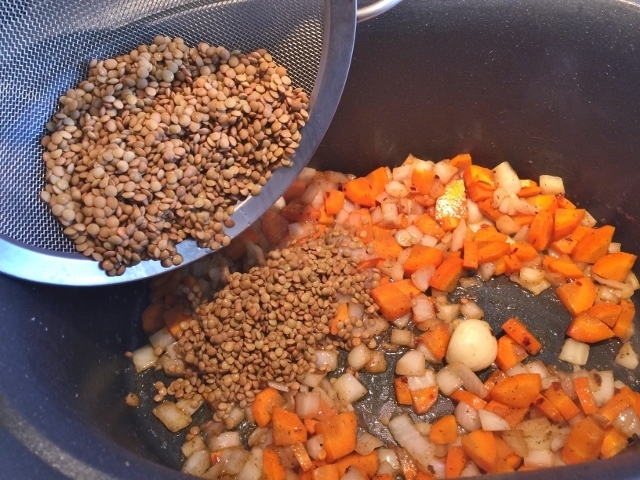 Add lentils, thyme and broth to onion mixture and stir to combine. Put insert back into your slow-cooker or add back into slow-cooker from pot. Cook on low heat for 6 hours. Ladle brothy lentils into bowl and place chicken on top. Dollop with yogurt – Enjoy! 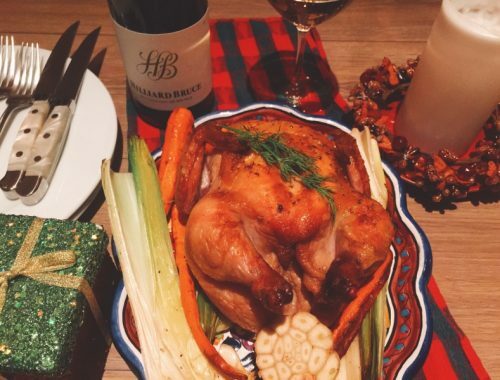 Cornish Game Hen for Two! Broken Noodle Chicken Alfredo Hotdish – Recipe!